Our product range includes a wide range of high performance high pressure ball valve cl2500 and high pressure flanged ball valves. Sankey 91 series forgedball valve is a high-pressure ball valve designed for the tough and rugged standard of the of instrumentation market in a 10000-psi body configuration. Delrin thrust washer – prevents deformation under high pressure. SANKEY Series 90 valves are robust two-piece ball valves in the industry. With advanced seat and seal materials, the Triad rating can be extended to handle service pressures to 450 bars and a temperature 250 Deg C.
All features of the standard Sankey Valves are present in the series 90 design including a heavy robust center section tapped for full hex head cap screws, Tertiary stem sealing design, body seals, anti-static protection and locking safety handles. 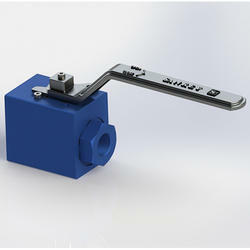 As with most SANKEY valve designs, our valve comes standard with a top flange designed for ease of actuator mounting. Solid Forged body, For All available NDT testing. Dual GFT thrust-washer prevents galling & prevents against deformation. Three layer of advance stem sealing.